It’s hard to keep up with everything that Temkin Group published in 2017, so we put together a couple of infographics to highlight some of the key data insights. 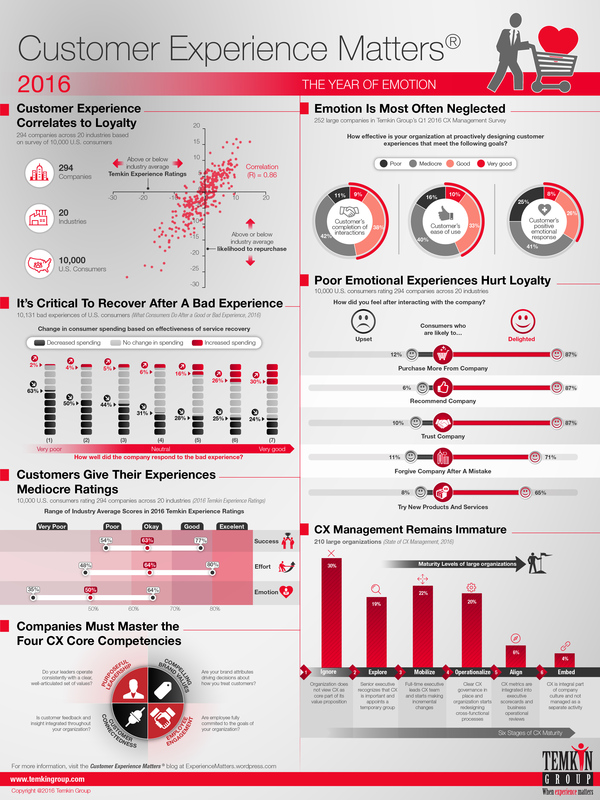 This first infographic looks at CX efforts and the ROI of those activities. Below the infographic you’ll find links to download the graphic (as well as a poster), along with links to the referenced content. In a recent post, I showed the correlation between customer experience and consumers’ likelihood to repurchase. Since that post was so popular, I decided to once again tap into our survey of 10,000 U.S. consumers to analyze the relationship between CX (Temkin Experience Ratings) and likelihood to recommend. To determine likelihood to recommend, we asked consumer how likely they were to recommend the company to friends and family. We calculated the percentage of each company’s customers who selected “8,” “9,” or “10” on a scale from “0” (not at all likely) to “10” (extremely likely). In the chart below, we normalize the data for 329 across 20 industries by subtracting each company’s scores from the average for their industries. As you can see, CX is highly correlated to recommendations (R= 0.70). In the chart below, we segmented consumers into five groups based on the TxR scores they gave companies (an average of success, effort, and emotion ratings). We then averaged the future purchase intentions of those groups across the 20 industries. As you can see, consumers who have had a very good CX are 5x more likely to recommend a company than consumers who have had a very poor CX. We examined the connection between customer experience and loyalty by tapping into our survey of 10,000 U.S. consumers to analyze the relationship between Temkin Experience Ratings (TxR) and future purchase intentions. To determine future purchase intentions, we asked consumer how likely they were to purchase more from the company in the future. We calculated the percentage of each company’s customers who selected “6,” or “7” on a scale from “1” (not at all likely) to “7” (extremely likely). As you can see, CX is highly correlated to future purchases (R= 0.75). As you can see, consumers who have had a very good CX are 54 %-points more likely to buy from a company than consumers who have had a very poor CX. Can a single bad experience cost a company money? You bet! As a matter of fact, 53% of consumers reported a cut in spending at fast food restaurants and rental car agencies after they’ve had a very bad experience. Those are the highest levels across the 20 industries we examined. At the bottom of this post we’ve assembled a number of industry-specific data charts that you can download and use. In the report, What Consumers Do After a Good or Bad Experience, 2016, we analyzed how 10,000 U.S. consumers changed their spending after having a bad experience with hundreds of companies. On average across all industries, 10% of consumers have had a very bad experience in the previous six months. After that experience, 37% of consumers cut back on their spending. As a result, 3,7% of revenues are at risk after a very bad experience (10% x 37%). This at-risk revenue ranges from a high of 6.5% for rental cars down to a low of 1.6% for supermarkets and retailers. If you’re looking for good data for your industry, we’ve put together these 20 industry charts. Feel free to use them within your presentations in accordance with our citation policy. At [Your Company’s Name], we work hard to improve our Customer Experience, and this industry chart from Temkin Group shows why even one bad experience can cost us lost sales. Angry: Customers feel wronged by the interaction and will look for opportunities to tell other people (a.k.a. vent) about the situation. They will try to stay away from the organization. Agitated: Customers didn’t enjoy the interaction and will think twice about doing business with the organization in the future. Ambivalent: Customers had no significant emotional response and will remain as loyal as they were before the interaction. Appreciative: Customers feel that the organization outperformed their expectations and are more inclined to do business with the organization in the future. Adoring: Customers feel like company fully met their needs and will look for opportunities to tell other people about the situation. They will try to interact more with the organization in the future. If you’re still wondering why you might want to talk about the Five A’s, here’s some data that will hopefully entice you to increase your emotion vocabulary. We analyzed the loyalty of 10,000 U.S. consumers based on the Five A’s of their emotional response to interactions across 20 industries – more than 100,000 overall interactions in total. As you can see above, the Five A’s aren’t just a set of words, they’re a strong indication of the loyalty of your customers. Compared with those who feel “angry,” customers who feel “adoring” are more than 11 times as likely to buy more, 17 times as likely to recommend the company, 9 times as likely to try new offerings, 6 times as likely to forgive the company if it makes a mistake, and 10 times as likely to trust the company. Training. If you teach all employees this scale, then your organization will have a common vocabulary for discussing customer reactions. This framework will help trainees gauge how customers would likely respond to situations and discuss what they could do to improve the customer’s ultimate emotional response. Coaching. Supervisors can ask their employees a very simple question after an interaction: “How do you think the customer felt about the call?” This can work for any employee that interacts with customers: phone reps, retail salespeople, cashiers, insurance agents, bank tellers, etc. The total across these interactions and decisions represents a customer delight score. Employees can calculate this score on a regular basis (daily, weekly) and track how well they are doing over time. Having an emotion vocabulary will hopefully get you to focus more about this critical topic. And if you just start talking about emotion, you will help stimulate employees’ natural empathy. So… start talking about emotion! The bottom line: Talk about making customers adoring, not angry. In case you missed it, we labeled 2016 as The Year of Emotion in our annual listing of CX trends. To help organizations better understand customer emotions, we created the Intensify Emotion Movement. Why did we put so much of a focus on emotion? Because it drives loyalty. If you’d like to see this data for each of the 20 industries, you can purchase and download the dataset for $195. To see what you’ll be purchasing, download this sample spreadsheet. The bottom line: Want loyal customers? Provide positive emotional experiences.